Benjamin F. Grady (Benjamin Franklin), b. 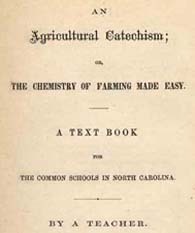 1831 An Agricultural Catechism; Or, The Chemistry of Farming Made Easy. A Textbook for the Common Schools in North Carolina. By a Teacher. An Agricultural Catechism; Or, The Chemistry of Farming Made Easy. A Textbook for the Common Schools in North Carolina. By a Teacher. Wilmington, N.C.: Engelhard & Price, Printers, 1867. Agricultural education -- North Carolina. Agriculture -- Examinations, questions, etc.